First year MEPN students entered the simulation lab early morning last week to prepare for their very first psych case scenarios. The students were divided into three groups and led to the appropriate stations where they would meet their patient. The assignment consisted of three case studies dealing with individuals with psychological and behavioral disorders: schizophrenia, depression, and alcoholism. These standardized patient exams (SPE) are unique and advantageous to student learning. SPEs give students the opportunity to apply what is taught in class and clinical rotation to real life situations. Additionally, it allows students to reflect and evaluate upon their actions as well as receive constructive feedback from faculty and staff. The actress, in the photo below, accurately simulated a real life example of a patient with depression challenging the first year MEPNs to treat it like a real event. 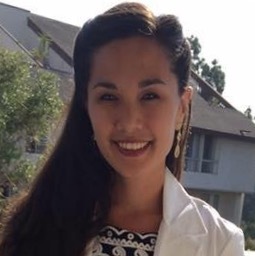 Britney Taganas and Thomas Badaro are seen using their therapeutic communications skills to provide comfort and concern to a severely depressed patient. 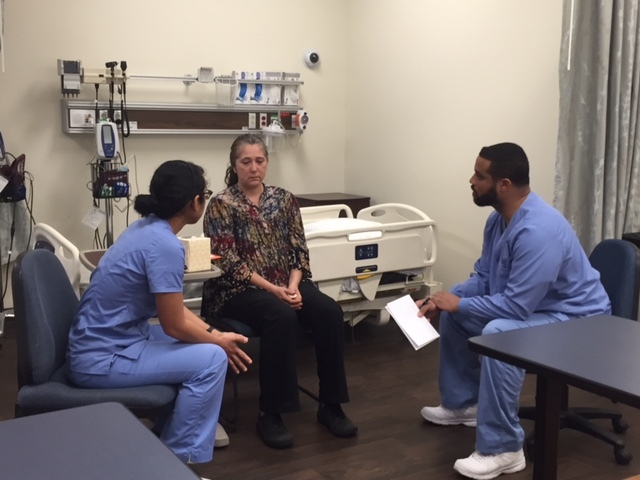 They had the chance to experience and recognize specific clinical manifestations exhibited by the client. This gave them, as well as other students, the chance to work together to use their knowledge and expertise to formulate a plan of care for the patient. This entry was posted in 2015 Cohort info., Guest Writer and tagged Guest writer, MEPN Class of 2017, Simulation Center. Bookmark the permalink. Very valuable exercise & great write-up!